SRINAGAR: Governor N.N. 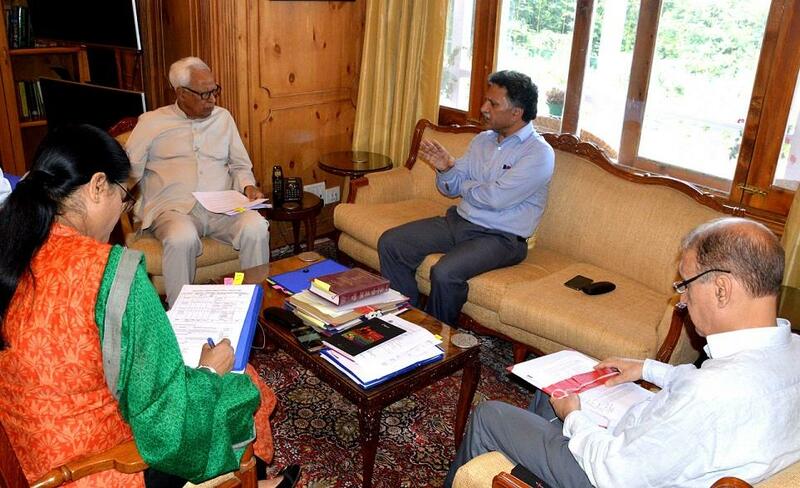 Vohra chaired a meeting at the Raj Bhavan to review the status of vacancies and the pace of recruitments in the Higher Education Department. The meeting was attended by Advisor to Governor, Mr Khurshid Ahmad Ganai; Chairman Public Service Commission, Mr Abdul Latief Deva; and Commissioner Higher Education Department, Ms Sarita Chouhan. Ms Chouhan informed that during 2014-18, 2357 vacancies of sanctioned gazette positions in the Department had been referred to the Commission which had, till August 2018, made selections to fill 1500 vacancies; 857 vacancies are still pending selection. Gazetted posts include Assistant Professors, Librarians and Physical Training Instructors in Government Degree Colleges; Assistant Professors employed in Government Colleges of Engineering and Technology and in Schools of Architecture. After extensive discussions regarding the potent factors which delay the process of selections by the Public Service Commission (PSC) the Governor gave the following directions: (i) Chairman Deva will draw up a prioritised list of the order in which recruitments to various posts shall be finalised by the PSC, considering the urgency of timely filling posts for the five new Medical Colleges; (ii) to ensure that there are no delays in the concerned Administrative Secretary promptly replying to any query raised by PSC in regard to equivalence of varied qualifications, all such references shall henceforth settled by an empowered Committee, chaired by Chief Secretary, which shall comprise Administrative Secretaries of Higher Education Department, Health and Medical Education Department, Agriculture Department, General Administration Department, ARI & Trainings Department and Law Department. This Committee : (a) shall examine all cases involving issues regarding equivalence of Degrees (particularly in the context of new and emerging disciplines) and their relevance to the post for which selections are required to be made; (b) shall take into account the general norms of equivalence of Degrees which are adopted by premier higher education institutions in the country and national level education regulatory authorities; (c) shall decide all cases within thirty days of the references received from the PSC; (iii) delays in the selection process of the Commission also take place for want of timely clarifications in regard to reserved, non-reserved and other categories of posts by indenting departments; in all such cases it shall be the personal responsibility of the concerned Administrative Secretary to reply to the reference received from the Commission within ten working days. Recalling the decision taken a few days earlier to provide secretarial strength to the PSC to visibly speed up the pace of its selection processes, Governor noted that cases had come to his notice where the concerned Administrative Departments are responsible for considerable delay in informing the PSC about the details of vacancies arising in the ensuing calendar year. Governor also discussed these delays with Chief Secretary who shall now be taking quarterly review meetings with Chairman PSC to ensure against any pending issue resulting in thwarting the selection process. It was further decided that Commissioner Higher Education shall undertake a fortnightly review of vacancies at all levels in the Higher Education sector and personally ensure that there is no pending issue which can delay the PSC’s selection process.